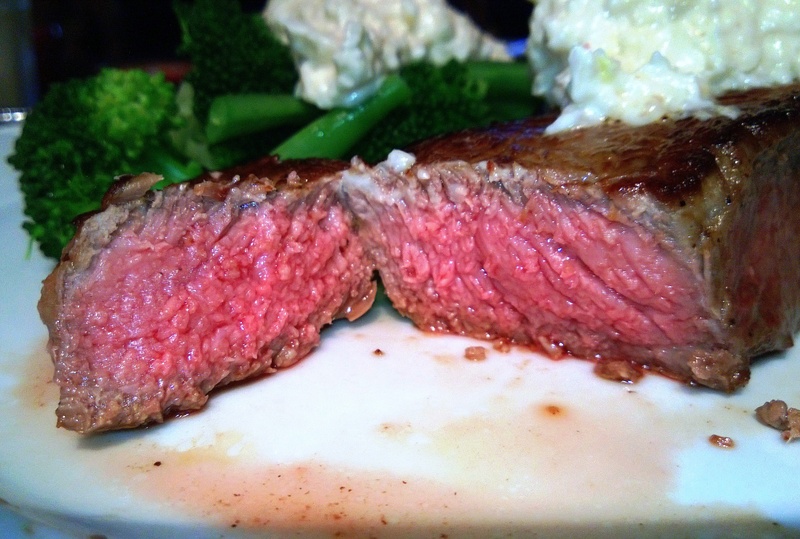 Cooking the perfect medium-rare or medium steak couldn’t be easier. I used to be scared of steaks. Of cooking them, that is. How could you tell how well done they were without cutting an ugly, great line through the middle? And who would want to be served that? Well, this method is as predictable as it gets for steaks that are 3 cm or so thick. I love recipes/methods that are easy to replicate. 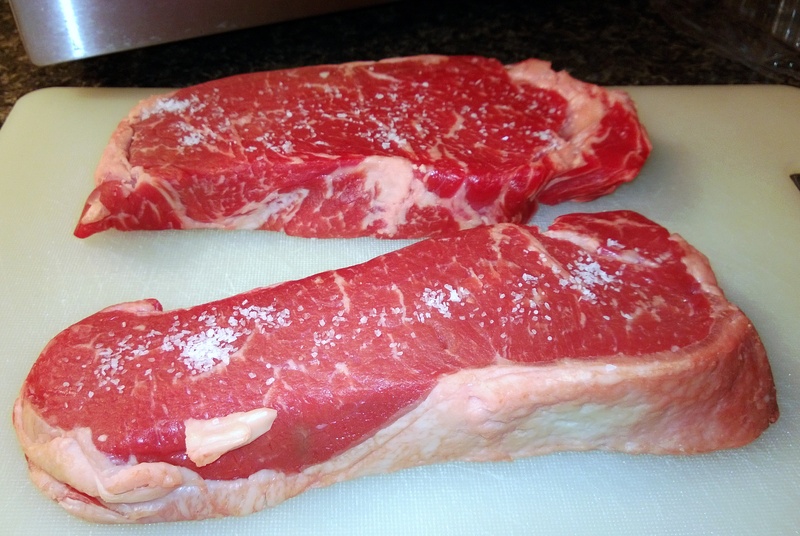 1 steak per person eating, must be 2.5-3 cm thick, the length/width is up to you. No non-stick pans for this method, the high temperatures of the stove/oven will release all their nasty chemicals. Also, you need a pan with a handle that can go in the oven. Nobody wants to deal with melted plastic on their heating element. Salt and pepper – or any other seasonings – to taste. I normally use salt, pepper and a drizzle of GF Worcestershire Sauce – in such small quantities, the brown sugar/onion powder present shouldn’t be problematic. If it is for you, then obviously don’t use it. Trim your steaks and pat them dry. Extra juices will allow them to stew, which we don’t want. If you have a combination of good quality steaks and the time/brains to think ahead, then after you have dried off the steaks, place them in your fridge, uncovered and let them dry age, flipping them every couple of hours. Dry ageing lets the flavours intensify as moisture is removed from the flesh and the time spent lets the enzymes that are naturally present in the muscle belly begin to break down the tissue, which increases the steak’s tenderness. Yum. It is best to hang them, but who really wants steak juice all through your fridge? If you have a dedicated room, go for it! But then you probably didn’t need me to tell you about dry ageing in the first place. Seal your pan and lower the temperature slightly to medium-high. Sear each side of the steak for 30 seconds. 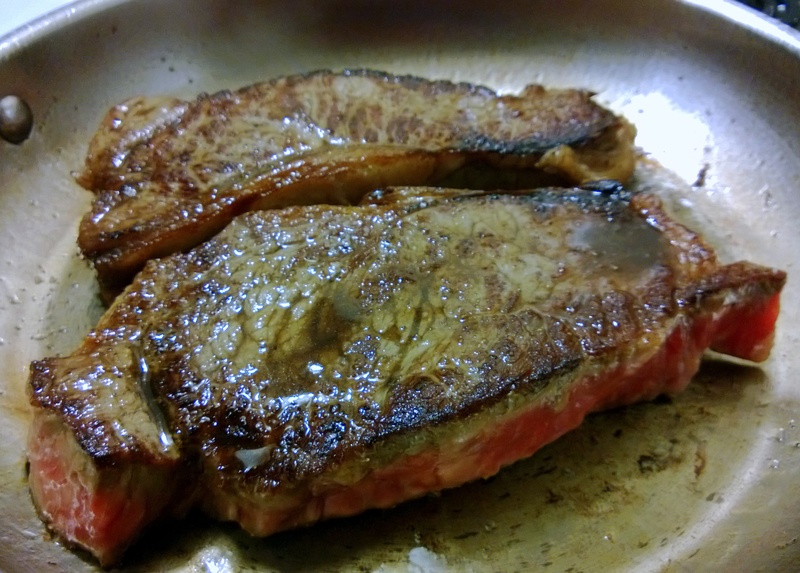 Place the fry pan in the oven for 2 minutes, then remove and quickly flip your steak(s). Replace pan in the oven for a further 2 minutes. 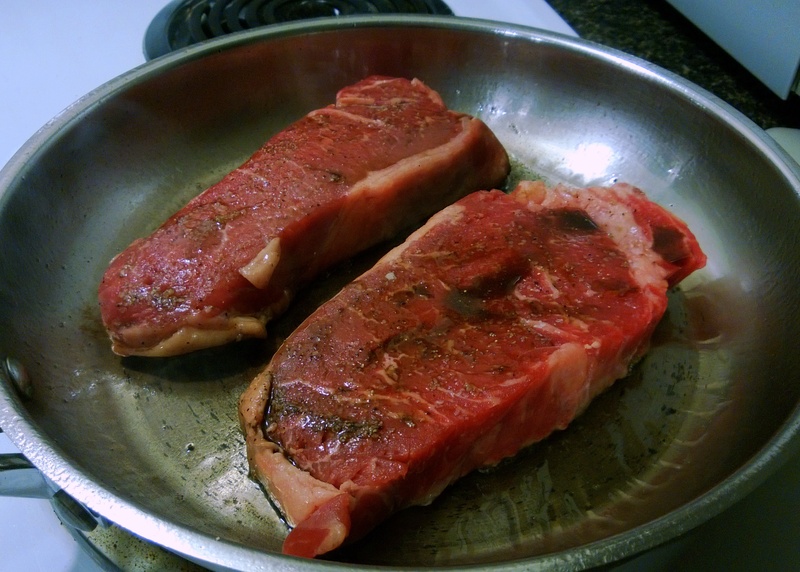 Remove pan from the oven and place the steaks on a chopping board to sit for 10 minutes. Unless you live in a fridge, they won’t get too cold. Don’t worry! Sear each side of the steak for 60 seconds. 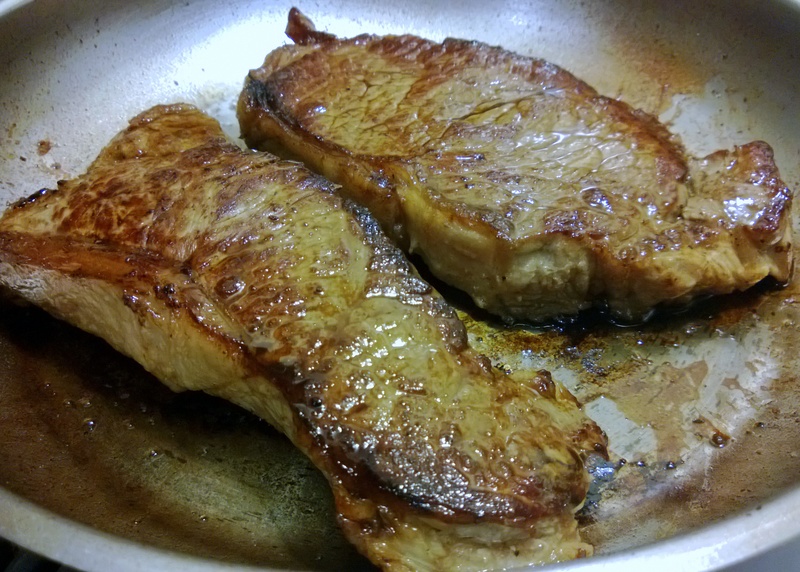 Remove pan from the oven and place the steaks on a chopping board to sit for 10 minutes. Serve with some steamed/blanched greens and the condiment of your choice – mustard, aioli with asafoetida replacing garlic, FF Caesar dressing. You name it, you can do it. 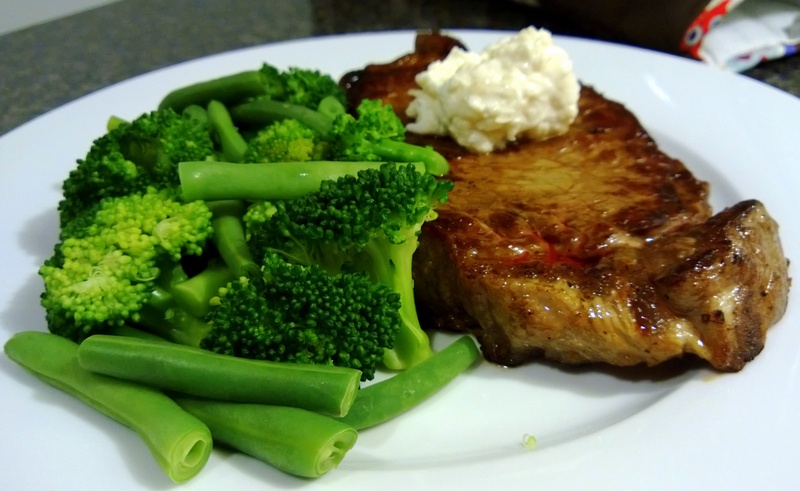 This entry was posted in Australian Cuisine, Carnivore, Dinner / Mains, Sauces & Dips, Tips and Tricks and tagged 30 minute dinner, beef, delicious, dinner, dry age, FODMAPS, fructose friendly, fructose malabsorption, gluten free, healthy, home-cooked, homemade, low fructose, meat, quick and simple, steak. Bookmark the permalink.